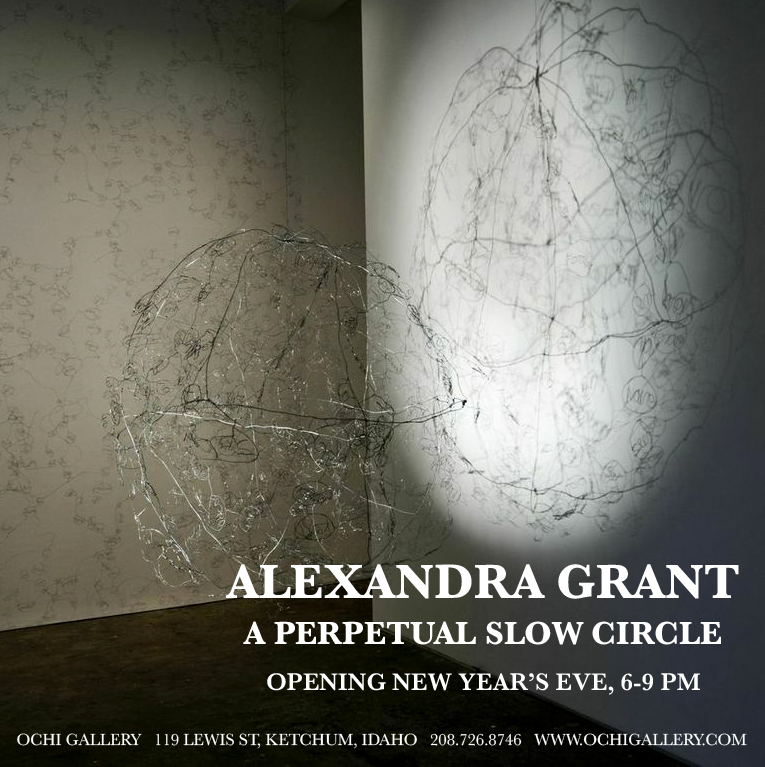 By appointment only, email gallery@ochigallery.com or call (208) 726-8746 for more information. Ochi Gallery is pleased to present “A Perpetual Slow Circle,” a survey of Los Angeles-based artist Alexandra Grant’s “nimbus” series made from 2004 to 2014. Grant’s “nimbus” works—which vary from kinetic wire sculptures to wallpaper, etchings to paintings—began with the display of her first nimbus sculptures at 16:1 Gallery and Machine Project in Los Angeles in 2004. Inspired by a short text written by the hypertext fiction pioneer Michael Joyce, the form in this series mimics nimbus clouds or whispers made out of silver wire filigree. The second iteration of the sculpture, which forms the center point of the Ochi Gallery show, “nimbus II,” was exhibited at the Museum of Contemporary Art (MOCA) Los Angeles in 2007 and the Contemporary Museum Baltimore in 2008 alongside Grant’s “Wallpaper (la escalera al cielo).” “A Perpetual Slow Circle” gathers “nimbus” works together for the first time as a complete body of work, including many that have not been shown before. Other works on paper and canvas are translations of Joyce’s “Nimbus” text into drawing, using pencil and eraser to mimic a web of language. Grant’s short film “MOTION” traces the evolution of the work from Joyce’s original hand-woven text into drawing, sculpture, and finally the kinetic movement of “nimbus II” at it spins and casts its shadow. Grant’s neon sculpture, “¿dónde está la escalera al cielo?” is a phrase that was transmitted into various of the “nimbus” works from another collaboration with Joyce, the “Ladder Quartet.” Phrases from the poetry of Pablo Neruda and Wislawa Szymborska are also absorbed into many of the “nimbus” drawings and the wallpaper work — showing how by nature language both proliferates and is absorbed, is at once viral and parasitic. The Avant-Garde Collection traces the museum’s acquisitions highlights across five decades, with a specific focus on the evolving definition of avant-garde during that period. In the 1960s it was cutting-edge to employ imagery from popular culture, and by the 1970s performance and installation were the bywords of innovation. In the 1980s new media and appropriation appeared on everybody’s radar for the first time, while the 1990s in retrospect were all about identity politics and post-colonialism. Due to the pluralist tendencies of the 21st century that make the notion of avant-garde seem quaint, the challenge for artists to produce work that conceals the influence of generations past is more demanding than ever. Drawn entirely from OCMA’s collection, the selection’s underlying premise is to combine the retroactive gaze that enables us to determine which artists transcended the avant-garde of their time and which did not, with an historical effort to reconsider works that may have been visible in their heyday but have since slipped from view, there awaiting future scholarly reassessment. Image: conspirar (after Michael Joyce’s “conspire,” 2004), 2005, mixed media on paper, 126″ x 80″. Photo by Brian Forrest. Collection of the Orange County Museum of Art. Grasshoppers is a children’s book created by Los Angeles-based artist Alexandra Grant in collaboration with the Polk County Historical Society (PCHS) in Osceola, Nebraska. Invited to be the Historical Society’s first Artist-in-Residence and to work with every 5th grader in Polk County, Alexandra suggested creating a book based on a local story. PCHS’s Patricia Larson suggested adapting her grandmother Belle Davis Hotchkiss’s story about the grasshopper infestation of 1874 (from an annal of local history, “Osceola 1871 -1971”). Florence Grant, a historian at Yale’s Center for British Art, and Alexandra’s sister, condensed the story. 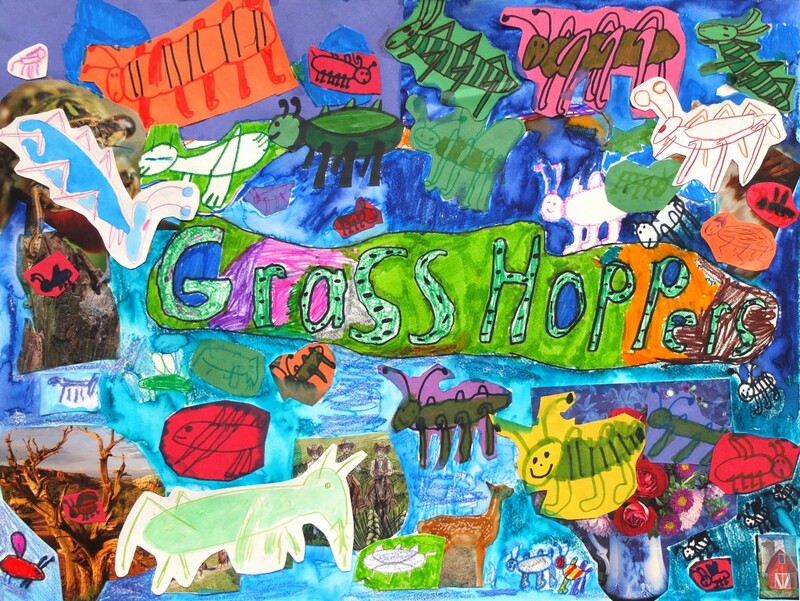 Over the period from October 4-8, 2013, Alexandra, Florence, Patricia and other PCHS volunteers worked with almost every 5th grader in the county and others to collaboratively illustrate the Grasshoppers story. The book was published in June 2014, with the participation of 145 people on the drawings and covers, with 19 original illustrations. Alexandra has developed a long-term relationship with Polk County and the Historical Society since she returned a stolen tombstone to a local cemetery in 2011. Grasshoppers is part of her commitment to exploring the role contemporary art can play in remembering and reimagining local history. The Polk County Historical Society will host a book launch and open house on Sunday, June 29th from 2-4pm at the Museum in Osceola, Nebraska. The address is State and Beebe Streets in Osceola. Postscript: Writing After Conceptual Art is organized by the Museum of Contemporary Art Denver and curated by Nora Burnett Abrams and Andrea Andersson. The presentation of Postscript: Writing After Conceptual Art at the Eli and Edythe Broad Art Museum at MSU is made possible by the Broad MSU’s general exhibitions fund. 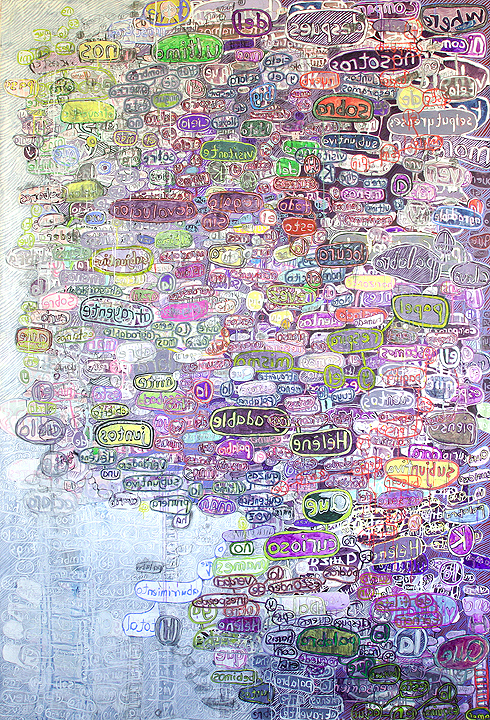 Image: babel, (after Michael Joyce’s “Was,” 2006), 2006, mixed media on paper, 80″ x 264″. Photo credit: Brian Forrest. Less than 50 years ago, “the Summer of Love” was more than a pop culture fad: it aspired to bring about a major social and political shift in America. Today, however, we face a near total lack of public debate about love as the basis of connection, understanding, and acceptance in our culture and our communities. Technological innovation makes it possible for us to be better informed about each other’s lives and feelings than any other time in human history. But is it deepening our connections with others? Or do cell phones, e-mail, and social media strip nuance from our communication and leave us lonelier than before? L O V E, Montalvo’s latest exhibition, considers the challenges of extending ourselves to commune and connect with others, with an installation of video, drawings, sculpture, and other works. Featured artists include Elisheva Biernoff, Double Zero, Alexandra Grant, Jon Meyer, Omar Mismar, Fiamma Montezemolo, Stephanie Taylor, and Allison Wiese. Through installation, sound work, video, drawing, and outdoor sculpture, participating artists explore the bonds of friendship; the important role of empathy in our lives; the intersection between desire and new technologies; and the complex relationships between love, belonging, identity and community. Friday, April 25, 2014, 6 p.m. – 8:30 p.m. Image: Alexandra Grant, I see my self in you, 2013, coated glass tubing, argon gas, transformer and mirror, 51″ x 16″ x 2″. Photo credit: The Lapis Press. Lora Reynolds is pleased to announce an exhibition of new work by Alexandra Grant, Century of the Self, organized by independent curator Sarah C. Bancroft. 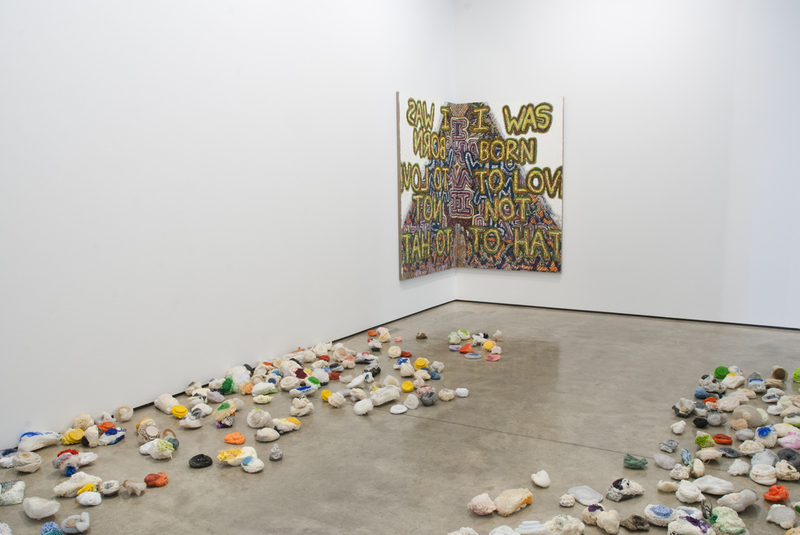 Alexandra Grant uses language, literature, and exchanges with writers as the basis for her paintings, drawings, and sculptures. Grant explores philosophical concepts of identity in her new text-based body of work, Century of the Self. The presentation of this series at Lora Reynolds Gallery is comprised of vibrantly colored paintings, works on paper, and a floor installation made from recycled plastic. Grant’s intimate as well as heroically scaled artworks, combined with poignant textual detail, delve into questions about how we define ourselves, who the ‘Other’ is, and the origins of the interior voices that fill our unconscious and shape our identities. Grant is known as a ‘radical collaborator’—it is collaboration that shapes what she does outside of the studio as much as within it. Grant has worked with writers as diverse as professor, author, and hypertext pioneer Michael Joyce; actor Keanu Reeves; and French feminist writer, philosopher, and playwright Hélène Cixous. Inspired by Adam Curtis’s BBC Four documentary of the same name, Grant’s textual references in Century of the Self are drawn from literary sources including Sophocles’s tragic play and character Antigone; work by the writer, poet, and activist Audre Lorde; seminal psychological texts by Sigmund Freud and his followers; and cultural movements that probed the unconscious mind, including Surrealism and Feminism. Grant does not claim to have found the ‘Self,’ rather she maps—through collage, Rorschach patterns, and textual quotations—what is a constant search. Alexandra Grant’s Century of the Self is an ongoing project that has taken a number of different forms. It was produced as a line of ready-to-wear clothing in collaboration with the brand Clover Canyon; presented as a billboard project on top of LAXART in Los Angeles; and exhibited as part of Los Angeles Nomadic Division’s (LAND) exhibition, Painting in Place. 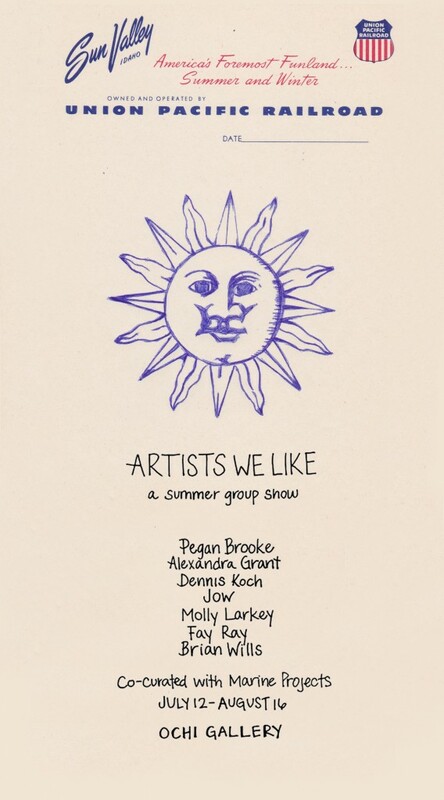 Recent works from the series were included in the group exhibition Drawn to Language at University of Southern California’s Fisher Museum of Art in fall of 2013. The exhibition at Lora Reynolds Gallery includes four new paintings—fresh from the artist’s studio—and several works recently exhibited at the Fisher Museum. Grant’s first solo museum exhibition was in 2007 at the Museum of Contemporary Art, Los Angeles. 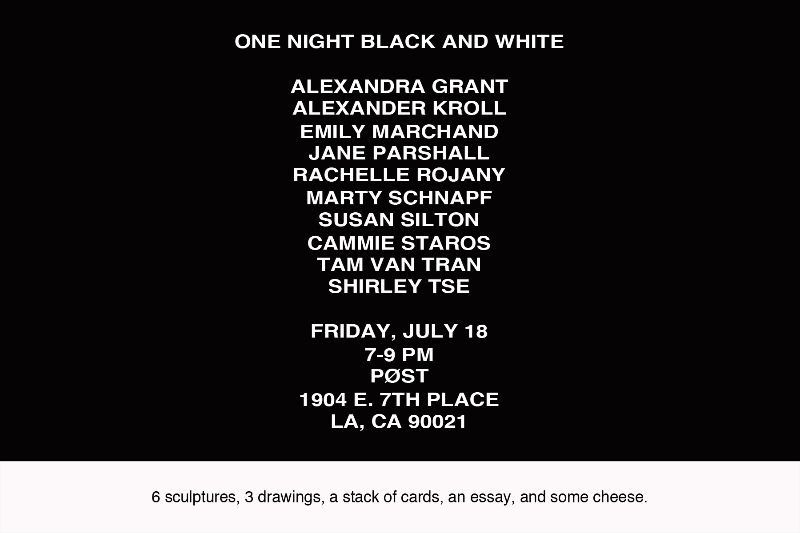 Grant has participated in numerous other major exhibitions, including the 2010 California Biennial at the Orange County Museum of Art; The Artist’s Museum at the Museum of Contemporary Art, Los Angeles; Human Nature: Contemporary Art from the Collection at the Los Angeles County Museum of Art; and Drawing Surrealism, also at LACMA. Her work has also been included in group exhibitions at the Contemporary Museum (Baltimore), the Center for Contemporary Art (Tel Aviv), and other institutions in the United States and abroad. Born in 1973 in Fairview Park, Ohio, Grant lives and works in Los Angeles. She is a graduate of Swarthmore College (BA, 1995) and California College of the Arts (MFA, 2000). 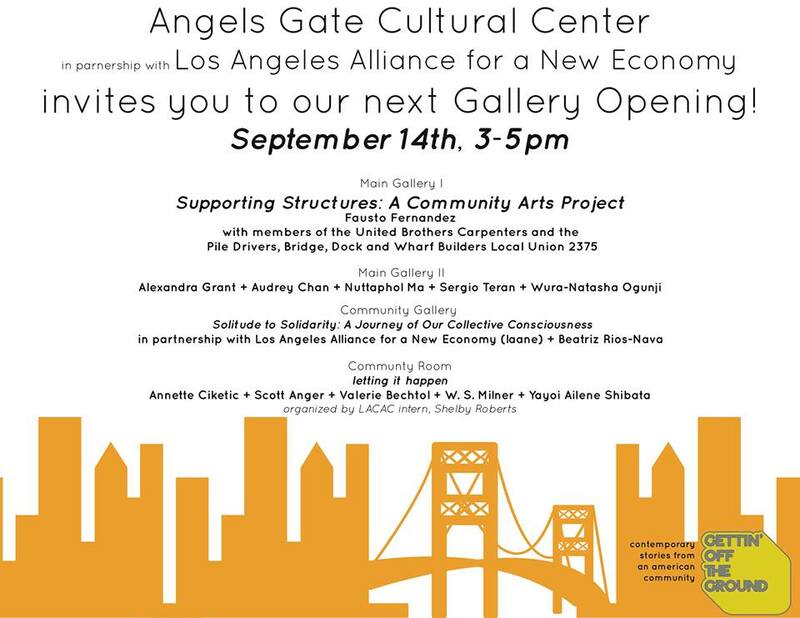 She has taught at CalArts, Cal State Northridge, and Art Center College of Design, and has received grants/awards from the California Community Foundation, the Durfee Foundation, the Pollock-Krasner Foundation, and the Frederick R. Weisman Foundation. Sarah C. Bancroft is an Austin-based independent curator and writer and serves as assistant director of curatorial affairs at the art initiative Fluent~Collaborative and its exhibition venue testsite. 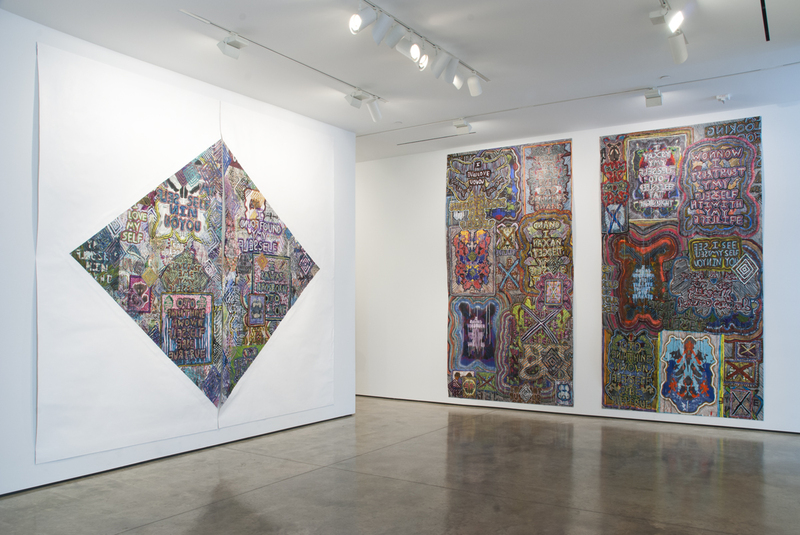 Prior to her move to Texas in 2013, Bancroft held curatorial positions at the Orange County Museum of Art from 2008 to 2013 and the Solomon R. Guggenheim Museum (New York) from 2000 to 2005. In addition to her critically acclaimed traveling exhibition Richard Diebenkorn: The Ocean Park Series (2012), Bancroft curated Two Schools of Cool (2011) and organized the 2010 California Biennial at OCMA. One of the projects she curated in 2009 was Video Work by Gao Shiquang and Chen Qiulin at OCMA as part of the Ancient Paths, Modern Voices China Festival produced by Carnegie Hall and the Segerstrom Center for the Arts. At the Guggenheim, she co-curated James Rosenquist: A Retrospective (2003). Bancroft received her MA in the history of art from the Courtauld Institute of Art (London). Her area of specialization is modern and contemporary art from the 1950s to present. She is a bike commuter, an urban hiker, and lives in Austin with her husband David. Top: Self and Other and Century of the Self (2) and (3), 2013. 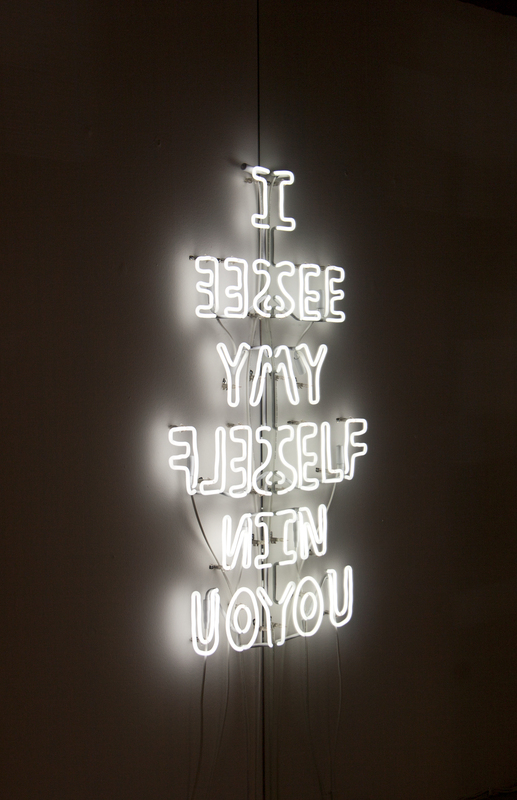 Bottom: Site/Self (projections) and Self (I was born to love not to hate), 2012.